Most people spend approximately half of their time at home. So it makes sense that your indoor air quality should be important to the health and wellbeing of your family. Businesses also need to ensure that their office HVAC and duct system is properly maintained to ensure good indoor air quality for employees. Sanitize air ducts: We use Sporicidin, an EPA-registered disinfectant solution that safely removes contaminants. Install germicidal ultraviolet lights: These germicidal lights destroy chemical and biological contaminants through UV sterilization when installed in ventilation systems so that clean air is circulated before leaving the ventilation system. Electrostatic filters: These filters replace disposable filters. They trap particles that are sent through the ventilation system. Some electrostatic filters contain anti-microbial agents to further limit contaminants. Since they are reusable, they can be cleaned regularly rather than being replaced. Microbial testing kits: We can sample and test your ventilation system and ductwork for allergens and microbes onsite. Testing kits provide immediate results. This will give us a general idea on what is lurking in your system. 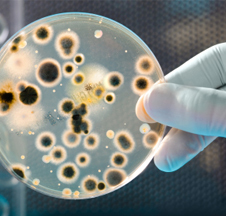 We also offer a more comprehensive and in-depth analysis where samples are collected by our Certified Mold remediation specialist and then sent to Laboratory for testing. Results take 5-7 days. Whole house HVAC cleaning: Our cleaning service is not just limited to air ducts. We also perform entire ventilation system cleaning including registers, grilles, heat exchangers, heating and cooling coils, drip pans, air handler and blower. Call Eco Pro Air today at 877-799-9221 to speak to one of our representatives to schedule a free estimate for air duct cleaning solutions for your HVAC system.